During my recent move, I made the mistake of sharing a few revelations with my wonderful husband. Going through the stash in preparation for packing revealed that I have more than I could possibly use in the near future. This is even more true now that I have a toddler again. Lugging all of the stash around the old apartment while packing, onto the truck, into storage, onto another truck, into the new apartment, and then into its new home in the new apartment... all of this revealed to me that I have much too much. With the prospect of doing this all again when we buy our house next year, I decided to use up as much as I could before that. This shouldn't be too much of a stretch. I have a list a mile long of planned projects. Many of them intended for gifts, so the finished item won't have to be moved again. The biggest challenge is the time factor. Towards the end of the move, I ran out of space and time and had to throw away some stash. Nothing that can't easily be replaced. Nothing worth crying over. Some batting and pillow forms. A box of miscellaneous craft supplies left over from previous projects and not since used. The revelation here is that a good sale is only a bargain if the acquired stash is put to good use. Otherwise, the costs of stashing it just become too much. Those costs being to some degree the obvious waste of money, but more so the loss of space, my husband's frustration, the lengthening list of projects and ideas that leads to them being set aside and forgotten about. All of this led to my decision to use up what I have and not buy any more stash... at least until I have finished a few projects and after we buy our house. Telling my husband about this decision was not very smart. It has not even been a month yet and I have already succumbed to the lure of bargain stash. Take a Stitch Tuesday ran with the crested chain stitch a few weeks back. It looked interesting and I wanted to try it, but I didn't know where. I was also offline for a while and couldn't access the directions while I was stitching. Well, I am back online now and finally found a place to try it. I did have to redo a part of it that was too crooked on the curve, but I like this stitch and plan to use it more. It adds a good deal of texture and interest. Here, the stitch was worked with rayon floss, fairly closely spaced, and over some couched fibers. In this detail, the original line of buttonhole stitches felt too straight and had too harsh a contrast of values. So, I added some lacing over the buttonhole stitches. The lacing thread was a silk tweed knitting yarn. I don't do much with lacing stitches, but I am pleased with the result here. The lacing pattern produced a nice wave like look and toned down the value contrast. It turned out so nicely that it's a shame it doesn't contrast more with the dark fabric underneath. I may try to enhance it a bit by adding small gold accent stitches or beads. After my recent move, I am finally getting settled and back to blogging. The new apartment wasn't ready until a week after we left the old apartment. So, everything went into storage and we went to visit my grandmother for a week. She was thrilled to have us and we had a wonderful visit. I took one project with me to work on. Only one fit in the car with all the baby gear. I chose the blue crazy quilt block that I started embellishing during Sharon's encrusted crazy quilting class last February. She is offering this class again in a few weeks and I highly recommend it. Her instructions are great for beginners and seasoned crazy quilters interested in applying design concepts to their crazy quilting. This is the progress I've made so far. None of the seams are really finished yet, but there are a couple of things to highlight. The white wavy seam is my attempt at the Portuguese Stem Stitch for Take A Stitch Tuesday. It wasn't done correctly as I was working from memory, but it is some variation of knotted stem stitch. Now that my internet access has been restored and I can stitch with the instructions, I will have to give this stitch another try. The chevron seam has straight stitches along side it. The idea was to continue the geometric shapes from the patch above it. This is my first try at doing this purposely. I'll be working at this more as my muse permits. This next seam is a herringbone stitch with buttonhole stitches done over it. I've tried it once before, but I like this one better. I used a #5 pearl cotton for the herringbone. Then the buttonhole was done with 2 strands of the new DMC color variations embroidery floss. 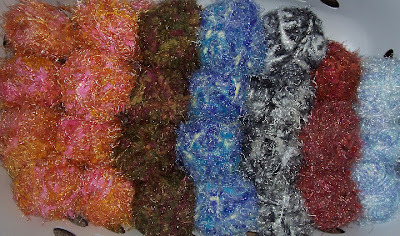 If you haven't seen this combination of stitches, Annie has instructions on her blog. There are several things going on here. 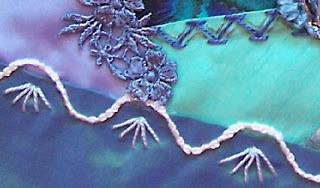 On the left seam is branches feather stitch that will have white stitches or beads added later. 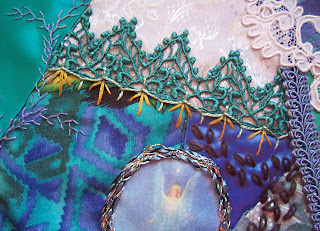 A fancy twist of fibers was couched down around a printed angel picture. I've started a meandering filler design with detached chain stitches on the right. Along the edge of teal lace, I started with a wide cretan stitch and then added rich yellow straight stitces for an accent. The yellow was picked up from the printed patch and will be repeated as an accent throughout the block.